You all might recall a little book called Eat, Pray, Love by Elizabeth Gilbert that made a huge splash in the literary world a few years ago. 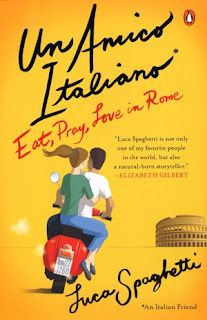 And those of you who do might also remember a very lively character from the book and movie named Luca Spaghetti who led Liz all around Rome and became one of her closest friends. Welp, this book is his book! I saw this book several months ago in a book store and I put it on the back burner of my mind for a while. When I saw it for sale on Kindle, well, I had to jump at it because at this point in my life, I can't get enough "Italian" anything! The title means An Italian Friend, and is very fitting. From the beginning of the book, Spaghetti has a great sense of humor and a distinct voice, which are important to me. In my head he even had an accent, go figure, but the whole way through I just heard this male voice with an Italian accent. I liked it. And I also really enjoyed this book. Besides just having the last name Spaghetti, this guy has quite an appetite for it as well. He describes pasta in all it's delicious glory, which is why I am quite sure at this point that if he met me, we would be desperately attached to one another solely on the basis of pasta. I love the way that he describes some of his favorite pastas, and how he even describes what happens when you eat those long, tubular pastas that shoot sauce everywhere. Aside from his appetite for food, this guy has an appetite for life, and it jumps off the page. He loves America, American classic rock, travel, soccer, and he loves his city of Rome. The way that this man talks about his city of Rome is as though he is talking about a woman, and it reveals something I have always suspected: the romance embodied in the Italian man. It also speaks to the level of beauty that is Rome. Rome is, in fact, breathtaking. And I loved that he appreciates that beauty on a daily basis--it gives me hope for the world. There is one thing about this book that really astounded me. I mentioned that Spaghetti is a soccer fan, but maybe that doesn't quite describe it: he's a fanatic about it, really. I surprised even myself by reading two or three whole chapters about soccer without being completely bored. SURPRISE! Anyone who knows me knows that I have about zero appetite for sports, but by some miracle, I kept on reading. I was glad I did. I also really enjoyed hearing him talk about his impressions of America and his travels here. It was his dream to come to America, and I just loved that. I loved how special it was to him to drive through our country and listen to our classics, and love it so very much. It's like how I want to rent a Fiat and drive down the boot of Italy listening to Italian classics--brava! If you love books about Italy, Italians, or just loved Eat, Pray, Love and might be curious about "the" Luca Spaghetti, this is a great, light read with a distinct voice. It was really enjoyable. I could relate to this memoir - everyone is dysfunctional in their own way, but Gilbert isn't afraid to put herself out there. I admired her writing style, her wit and ability to laugh at herself. She is poignant about issues that many people face everyday. Interesting perspectives on three different cultures which richly contrast with American life.